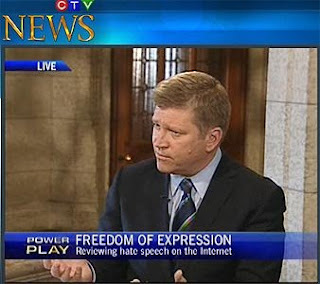 The FreedomSite Blog: [VIDEO] CHRC fails to CENSOR CTVNews debate on Censorship! 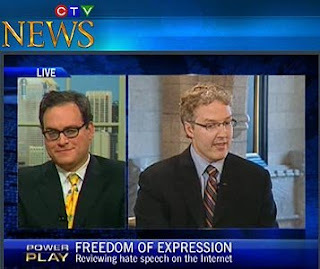 [VIDEO] CHRC fails to CENSOR CTVNews debate on Censorship! This evening, Jennifer Lynch, the chief commissar of the Canadian Human Rights Commission, tried to have CTV Newsnet kick me off their interview program Power Play, hosted by Tom Clark. To their great credit, CTV refused to be bullied -- and it was Lynch who wound up off the show. She tried to censor me -- and, much more ominously, CTV. She tried to bully CTV into blackballing me from their show. She tried to tell them how to run their news business. In other words, she was just being herself: a soft fascist; a censor; a bully; someone who thinks the government can tell people what they can hear or say. It's with tremendous admiration that I can report CTV didn't waver for a moment. My invitation was never once thrown into doubt. Lynch's was. She was the one who threw down the conditions to CTV: either I had to go, or she would. She thought CTV would say, "yes, boss." To her surprise, they didn't. And that ruined Lynch's plans, because she was ready to sell her mush on TV, but she ended up kicking herself off the show! She panicked. Instead of it being just her on CTV, it would be just me! So she sent along a young lackey from her office, named Philip Dufresne. But Dufresne was told he could only go on the show if he promised not to talk to me! CTV aren't dummies. They saw how journalistically delicious this was. So they agreed to have us on back-to-back, instead of in an actual debate. I had the advantage of going second. And -- far more importantly -- Clark spent a good amount of time exposing the behind-the-scenes machinations the CHRC had gone through to try to scupper my appearance. Any guest who pulls such a stunt deserves to be exposed for it. But a censor like Lynch, claiming to respect free speech and claiming to want a debate? Well the Orwellian hypocrisy was just too delicious for CTV to ignore. Clark opened with a powerful -- but professional -- timeline of Lynch's bad behaviour. And he ended his interview with Dufresne with a pretty basic question: would you ever debate Levant? Dufresne pretended he didn't hear the question -- but tens of thousands of CTV viewers did. The CHRC's media magic at work!